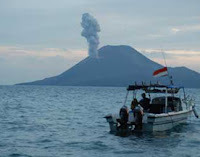 Krakatau Mountain which located at the Sunda strait can be seen from the boat at the Merak-Banten to Bakauheni, Lampung. After take a rest for a while at the Travellers Krakatoa Nirwana Resort, my friend form Jakarta and me go to Krakatau. We use wood boat with 30 passengers, then we leave Krakatoa Nirwana Resort dock in the morning. Yundi Nayadilaga, Activity Manager Travelers Krakatoa Nirwana Resort the tour guide said, morning wave and wind on the ocean is friendly now. "Usually the wind change on noon". Even it still quite, it is advisable to always wear the orange buoy. 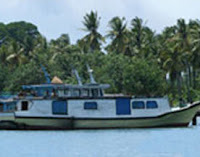 The boat that we use, carry passengers from Canti dock, a small dock at the Kalianda city to Sebesi island. This way also become one of alternative way to go to Krakatau. From Sebesi island, we can continue the journey using rental wood boat. But don’t forget, you have to have simaksi (license to enter the Conservation Area from Badan Konservasi Sumber Daya Alam (BKSDA) Bandar Lampung). If the wave and the wind calm, the journey from Krakatau Mountain takes about 3 hours from Travelers Krakatoa Nirwana Resort or 2 hours if you leave from Canti dock. The journey could be faster if we use speed boat which offered by the resort. The price is Rp 3.5 million for 10 persons. It takes 2 hours from resort or 1.5 hours from the Canti dock. This packet also offer 7 hours adventure, include visit the Sebesi Island and Umang-umang island. Those islands has beautiful beach and you can swim in there. Our boat speed up through Merak Belantung strait and bamboos to catch fishes. This become a very unique scenery. Out form the small strait, our boat entering the Lampung strait which is bigger than the strait before. Entering the Sunda strait, our boat start to shake. The ocean water splashes the boat. Yundi said our journey is still save. The wave and the west wind which predicted hold until the end of February from Kalianda-Anak Krakatau still more gentle than if we depart from Anyer or Carita, Banten. "We not use the straight way, but we take the back street through the Sebesi island and Sebuku island. We can hide at the back of these islands. Besides, the scenery is beautiful too", said Yundi. When we arrived at the east side of the mountain, we found no other boat. Whereas, on Saturday usually there are at least five boats from Kalianda or from Anyer. Black sand and pumice stone is beautiful, many miners take it. That mountain is result of three island volcanic activity Rakata, Sertung, and Panjang, Krakatau giant eruption scrap on 27th April 1883. When it blow up, more than 3,500 people died, plus with the earthquake and darkness that cover up this planet because of the volcanic dust. 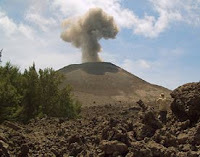 This volcanic activity still grow until know about four centimeter each year. The blowing wind flied dust to our nose and mouth. You can smell strong sulfur here. After 30 minutes hiking we arrive at the hill. It’s look like a bulwark, we pass sand and rocks which are made from lava and ocean pine. We can hear birding combine with the sound of the wave and the wind.